﻿ Rummana Boutique Resort, Koh Samui | FROM $82 - SAVE ON AGODA! "Very classy, clearly designed and maintained with love and a..."
Have a question for Rummana Boutique Resort? "One of the best place i have been in Samui." 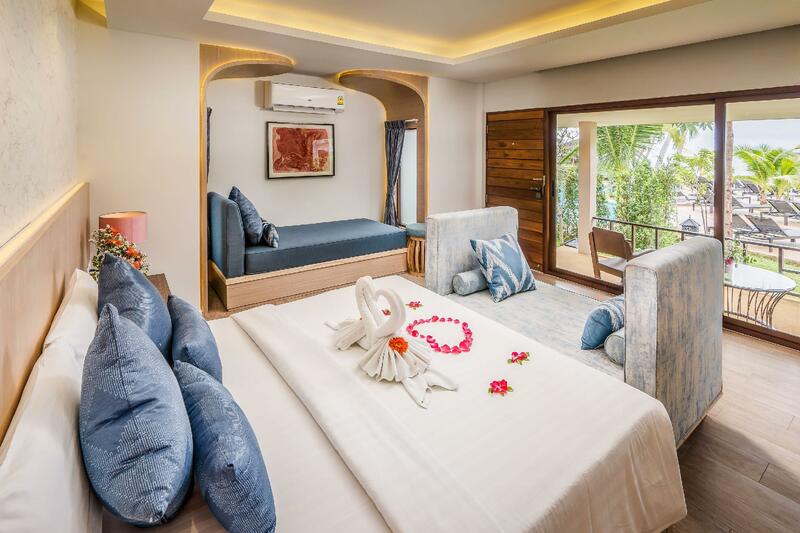 The Rummana Boutique Resort is nestled in a beautiful garden at the southern end of Lamai Beach where you can relax with a scenic view of a white sandy beach embracing by the emerald sea of the Gulf of Thailand. The resort is 18km from Samui Airport and 17km from the main tourist area. This resort is at the quiet end of the beach so guests can relax with a beautiful view by warm waters. There is a short walk from the resort into lamia town where there is a good selection of restaurants, bars, discos, and various other places to go. The resort is also very close to the island's famous Grandfather and Grandmother Rocks. For your reservation at Rummana Boutique Resort, please select your desired dates of stay and submit our secure online booking form. "Very clean and staff is helpfull." When we arrived, the desk clerk put us in a room of a lower catagory. A3 star neer the neighboring hotel which was noisy in the middle of the night. When I called security, the manager moved us immediately to a 4 star room. The service was great! Very classy, clearly designed and maintained with love and an artistic eye. Fountains and ponds everywhere, the soothing sound of rippling water mingling with the tides... Each room is a separate free-standing pavilion or cabin. The lot is fairly narrow and quite deep, and seems WAY bigger than it probably is because of the winding pathway and the lovely lush plantings. The only thing I would change is to paint a line along the winding path from Reception to the Beach/Restaurant... because it can be very confusing to figure out whether the fork in the path leads to another pavilion/room or your goal. (Like a 3-D reality video game!) Unfortunately, the beach sand was recently swept away, so the beach area is rocky -- but it is easy to walk down the beach a bit. The large rocks on the right are spectacular, and fun for kids to climb and explore. I really like this hotel. It is a small hotel but you don't really feel it because they way it is set up makes you feel like you are hidden in a tropical land and you care barely see the edge of the hotel. you only see trees and plants! 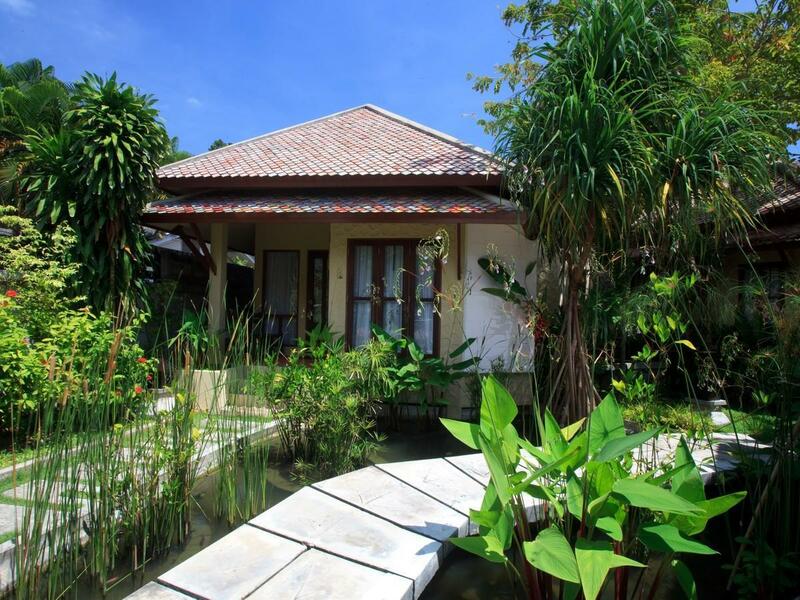 You have your own bungalow covered with tropical trees and lovely plants and flowers. The hotel is very clean and the staff is very friendly. They always watch out for what you need. The guest service was nice. The food was great. Location is great too. I think it's one of the best spot on Lamai beach. I have enjoyed two superb holidays at Rummana. The beach villas are private and secluded in a magical design and the restaurant/pool area offers a wonderful beach view. 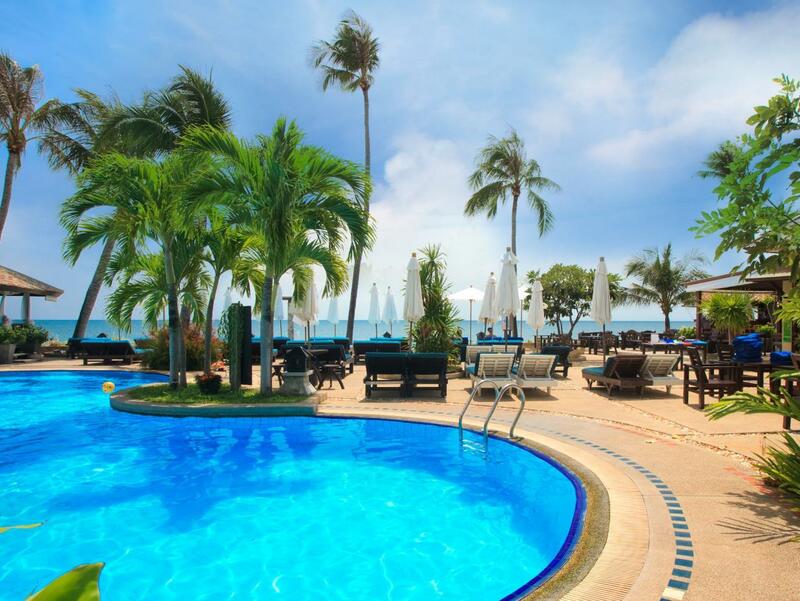 Easy access to great restaurants and nightlife in Lamai. Upon check-in we were warmly greeted and given cold towels to refresh and a cool coconut. They congratulated us on our recent marriage and had our room done up lovely with rose petals on the bed and a special cake saying, 'Happy Honeymoon'!!! We couldn't believe it! They also told us that we would be upgraded the following day to one of only two seaview suites that they have. This was a fabulous and spacious suite with a jacuzzi. Very clean and comfortable with very friendly staff who go the extra mile. Very friendly, clean, right on beach. Free pool towels and beds. Free water. Beautiful hotel right on beach. Staff very friendly and helpful. Lovely clean beach. The only thing we didn't like was the unexpected service charge added on to prices. Other than that, lovely and would definitely return. Lovely breakfast. Rummana is lovely Boutique Hotel situated at the southern end of Lamai Beach, near Grandfather Rock. The hotel is on a narrow block which winds its way up the slope to reception, with a series of paths enlosed by tropical gardens with many water features. This creates a tranquil and tropical setting. The rooms are a good size with all the features who would normally expect from a quality resort. Although the shower is within the bath, which makes it a little more difficult for elderly guests. The price for us included breakfast which was a very high quality buffet, with enough choices to cover western and eastern cultures. The service at the hotel was very good without being in your face. Nothing was too much trouble. It was our first time to Koh Samui. The hotel ambience was very warm, welcoming and romantic. Staff were very helpful. The beach was not overly packed and the sea was clear. Rooms were very clean and kept clean as well. The surrounding was very clean and quiet. The entire stay was wonderful. the rooms are very private. i got to the resort 2 days late and the resort did not charge me a penny more, great food fantastic staff but most of all fantastic location just a 2km drive to the main town which has eveyrthing, i would stop there every time i go to samui. justin beard england. We liked the Rummana hotel very much. The territory of the hotel is big and green. The pool is located near the beach. The beach itself is very clean, the sand is white and the sea is also clean. One of the best beaches during our three-week trip in Thailand. The restaurant is also located near the beach. Breakfast are good. In the restaurant area you can also use free internet during your stay. The location of the hotel is about a 10 minute walk to Lamai (although we never actually did it), there are some shops and restaurants outside the hotel so you are not isolated. The sea was actually quite rough (all the time) so I would not recommend swimming. A gorgeous layout with plenty of water features and greenery among the villas. The hotel is a bit far from Lamai center, however, so perhaps better if you rent a motorbike. Friendly Staff, Nice Gardens, Great thai food. Friendly Staff, Nice Gardens, Great thai food. Rooms are a little bit outdated but big and clean. The photos on the website make the rooms and resort look far more attractive and spacious than it actually is. you expect a little more, especially in the low season. the resort can only offer a small childs bed as an additional. Disgusting pool, No view overgrown garden. I´ve been living in Thailand for 3 months now and been going on weekend trips. I can easily say that this was not for me and my son(6y). If I would get this place för half the price I still would choose something else. We booked into this hotel because we turned up to a hotel nearby which was awful. 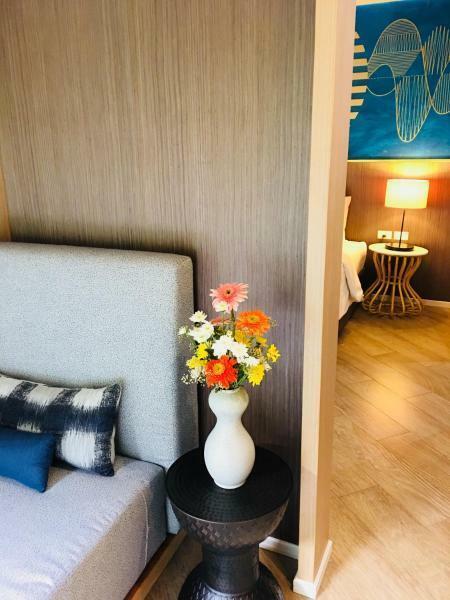 The hotel was clean, modern and comfortable and the staff were all very friendly but there was just something about the design that made it feel disjointed and removed from the feel of the beach. the staff and there willingness to help and do anything they could to make our stay a pleasant one. not child friendly at all would be ok for couples that want small get away but not ideal if elderly or with very young children. pool was not child friendly as were some of the guest also who acted like regulars put us well off having a child with us. it was so unusual to find the staff so child friendly and the patrons being the other way. our child was great whilst there she is only one and very quite there another 2 children there most of the time but were so scarred to do anything or make a noise not right as it is the children holiday also maybe another shallow pool for the children keeping them from adult area may work. we shall not use again child or no child but do wish the staff well. Nice hotel wich is located a bit farer away from Lamai City, so you need to use the most expensive taxi service in Thailand everytime you want to go there (THB 200 for a 5 minute ride). Beach is very nice close to a rock cliff. Nice garden with Koi Fish ponds etc. Rooms are a bit old but functionable and cosy. Very nice staff.